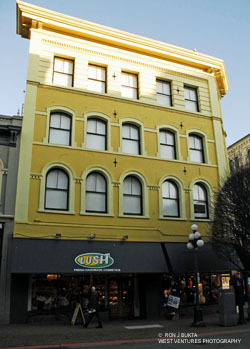 The Hamley Building, named after its original owner, Wymond Hamley – Collector of Customs for British Columbia from 1864-1871, was constructed on the site of the old Fort Victoria Garden. The round-headed windows and detailing are identical to those on the Bridgman, Greenwood and Albion Hotel buildings, so it is possible that Dennis Harris designed them all. The fourth floor was added in 1912 to a design by William Ridgeway Wilson when the building was owned by Mrs. Diana Irving, daughter of Wymond Hamley. In 1907, the tenants were A. W. Harper – surveyor, E. P. Colley – surveyor, J. M. Whitney – jeweller, and Dominion Express. Today, the building houses a souvenir outlet and a soap factory.